It’s fiesta time!!! Cinco De Mayo is such a fun holiday to celebrate if you’re like me, and love delicious Mexican food! This year, we are whipping up our own Cinco De Mayo Menu. Filled with yummy goodness like Mexican Mocha and Mexican chicken wraps, and all topped with our secret (crazy good!) 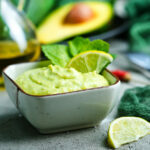 avocado cream sauce which will take any party menu and make it spectacular. Instead of going out to a favorite restaurant, I’m cooking up a storm for a group of friends, for a fun way to celebrate all together…and, let’s be honest, for the unlimited Paloma cocktails that are so simple to make right at home ;) In this post, I’ve come up with what I imagine to be the best Cinco De Mayo menu around and an super excited to share all the yummy things I plan to make. Let’s get the party started! 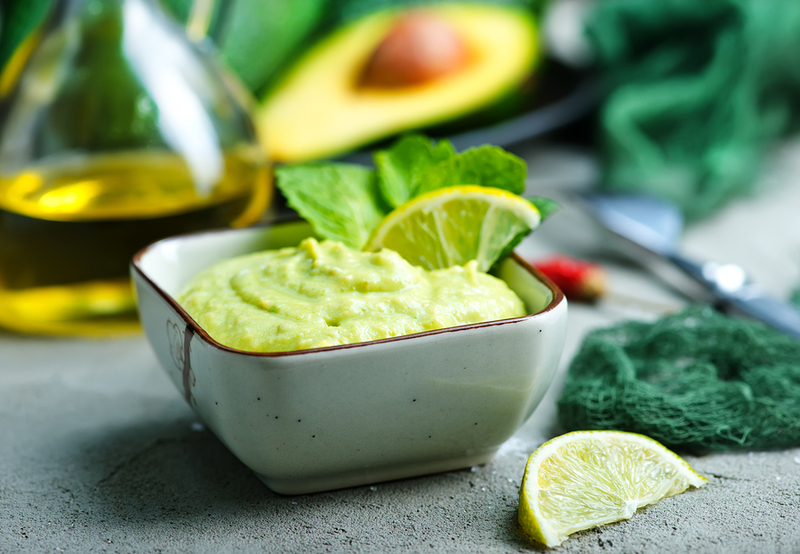 Before we jump into the meat of our Cinco De Mayo Menu we need to talk for a quick sec about the condiment that will bring it all to light, my favorite avocado cream sauce! This sauce can literally take a plate of anything and make it amazing, although all the recipes for Cinco De Mayo below are amazing on their own. I want to share this recipe first because if it is literally the only thing you make from our entire Cinco De Mayo menu you will be so happy you did. Combine all ingredients in a food processor a blend until smooth and creamy. Before serving, warm the sauce in a pan over low heat, and pour over your handmade ravioli for the most delicious little pockets of Mexican goodness! Now let’s get onto the rest of our exciting recipes for your Cinco De Mayo parties! 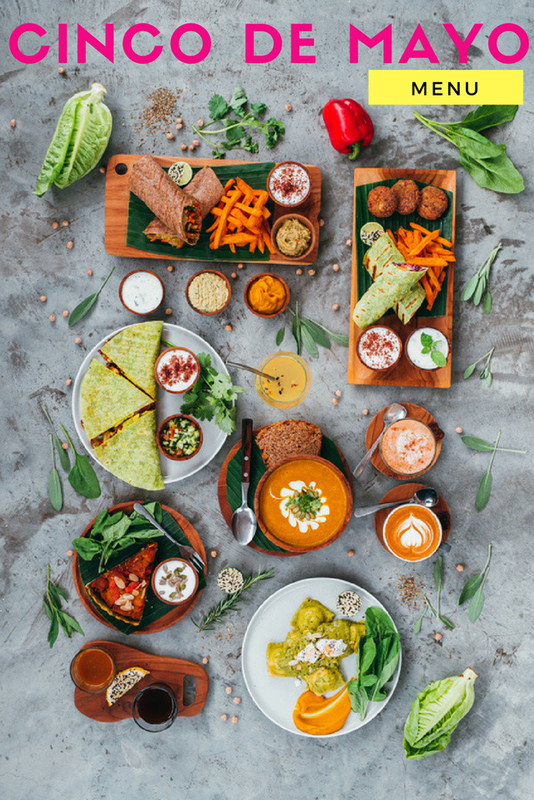 Wouldn’t it be fun to create a large wall size menu board for this food centric celebration? 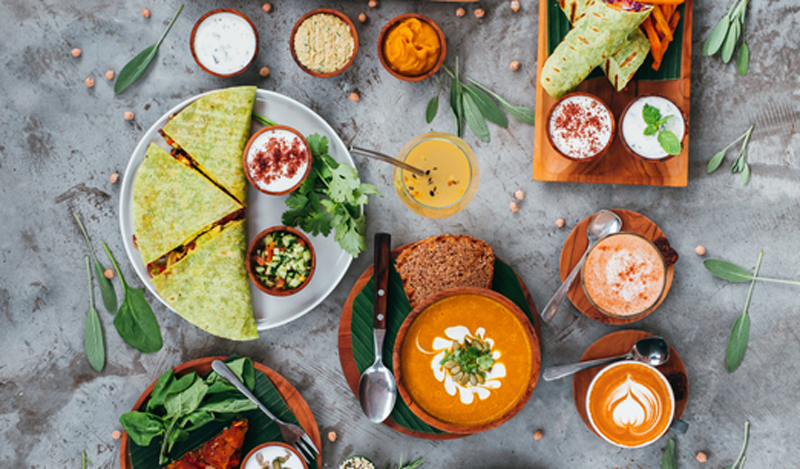 One thing to think about when planning this years Cinco De Mayo celebration is that food should be the most prominent element at the party, but that doesn’t mean you can’t have a little fun along the way! Here’s a few of our favorite Mexican fiesta decorations that are all DIY and totally doable. Fiesta party balloons that will instantly make the entire space feel like a colorful burst of fun. And the cutest cactus fiesta cake toppers. Who says Cinco De Mayo is only an evening affair? I’m starting the day off right, swapping my typical coffee for a sweet and spicy Mexican Mocha. With a hint of chocolate, it’s the perfect morning pick-me-up! 1. Brew coffee or pull two shots of espresso. 2. Add the chocolate, sugar, cinnamon, nutmeg, and cayenne. Stir to combine. 3. Froth your milk, or just pour it all in if you don’t like foam. *Pro tip: If you don’t have a milk frother, pour warm milk into a lidded jar and shake it real good! This dish is great for a party because it’s vegetarian! After all, not everyone is a fan of meat, and with this Cinco De Mayo recipe, it won”t be missed a bit. 2. Drizzle olive oil over the diced sweet potatoes and bell pepper and roast for 25 minutes. 3. Mash 1 can of black beans and spread onto defrosted pie crust. 4. Once potatoes and peppers are done, place in a large bowl and sprinkle with garlic powder, chili powder, cinnamon, salt, and honey. Mix to combine. 5. Follow directions on frozen pie crust to prepare for filling. 6. Once pre-baked, fill pie crust with the potato and pepper mixture, pressing down slightly so the filling is no longer loosely packed. 7. Bake at 350 degrees for 15 minutes, or until pie crust edges are golden brown. 8. Once baked, top with slivered almonds for a yummy crunch and serve with a side of sour cream. 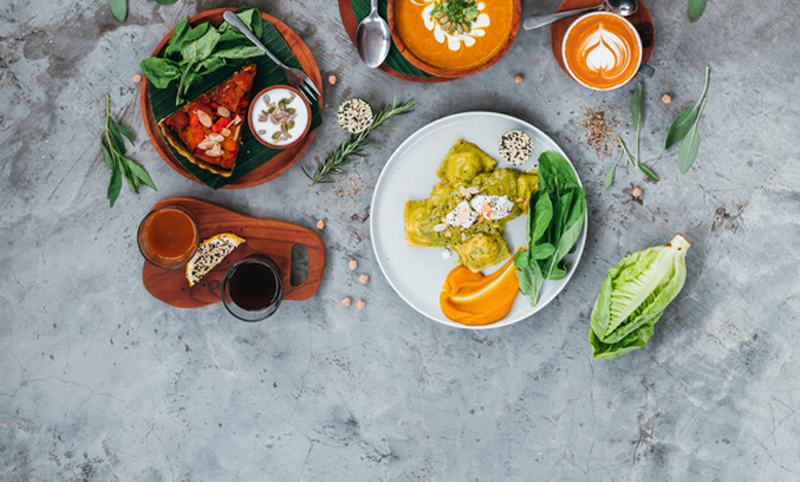 A wrap is perfect not only on Cinco De Mayo, but for a quick, filling, and healthy lunch or dinner any day of the week. I love using sun dried tomato tortillas because they’re bright and pretty. But you can use any flour tortilla you’d like…as long as they”re big enough to hold all the goodies inside! Don’t forget to add in that avocado cream sauce we just made, it is so good inside these Mexican chicken wraps. 1. Mix shredded chicken breast with taco seasoning. 2. Fill tortillas with all of the remaining ingredients, drizzling with salsa and hot sauce to your taste preference. 3. Wrap it all up, slice in half for easy munching, and serve! I love to eat mine with a side of our avocado cream sauce and a squeeze of fresh lime…YUM! This quesadilla recipe is a late-night fave in our house even when we are not planning an entire Cinco De Mayo menu to carry us through the day. I’m absolutely a fan of breakfast after-hours, so I’ll be serving these up to my crew long after the sun has set, as a little midnight snack. Because no one should go to bed hungry after a big night out, am I right? 1. Fry the bacon in a pan. When cooked, set aside on a plate lined with paper towels to soak up excess grease. 2. In the same pan, remove all but a little bit of bacon grease and add onion and jalapeno, cooking over medium heat until the onion is translucent, about 5 minutes. Set aside. 3. Whisk together eggs, half & half, and salt & pepper in a bowl. Add a tab of butter to the pan and pour in the eggs to scramble. 4. Once the eggs are cooked, begin assembling your quesadillas by laying out the tortillas and layering with cheese, jalapenos & onion, bacon, eggs, avocado, and more cheese, topping with a second tortilla. 5. Melt a bit more butter in the pan (more butter, more better!) and carefully transfer the stuffed quesadilla into the pan, cooking about 3 minutes per side, or until the tortillas crip and brown. 6. Cook these babies one at a time making your Cinco De Mayo menu feel like a special event – serve nice and hot! Pico de gallo, our avocado cream sauce, and fresh cilantro are some perfect accompaniments to fancy up this super simple dish! *Ok, I am going to warn you…this kind of recipe is not for the last-minute party planner. It takes some time and preparation, but I can guarantee you, that when you take that first bite of this dish, you’ll know exactly why you spent days (ok, maybe not that long) slaving away in the kitchen. It will be the instant star of your Cinco De Mayo menu – Just trust me on this one! 1. On a clean cutting board, pour out 2 cups of flour and then use your hands to make a well. 2. Into the well, crack the whole eggs and yolks and add the teaspoon of salt, whisking together with a fork. 3. Once combined, gradually mix in the flour until a dough has formed. 4. Knead with your hands (or if you’re fancy, you can use a stand mixer with the dough hook attachment) for about 5-10 minutes, or until the dough is elastic and smooth. If you need to add more flour or water to achieve the correct consistency, do so in single teaspoon increments. 5. Wrap the dough ball in plastic wrap and let rest for 30 minutes. [NOTES: Now is a good time to get your pork going! Also, the next step involves rolling out the dough…*I highly suggest you use a pasta maker,* but if you don’t have one, you’ll have to put your trusty rolling pin to good use! 6. Cut the dough into quarters and *either* begin rolling out each section by hand, until the dough is thin but not transparent, about 1/16 inch thick *or* if you have a pasta maker, feed the dough through the pasta attachment, starting at the widest setting, and ending at the second to last, turning the setting down by one each time the dough passes through. 7. Then, cut each of your four rolled-out sheets of dough in half, so that you now have 8 strips. 8. Fold the first strip down the middle to create a crease, and open back up. 9. Place a tablespoon of carnitas about 1/2 inch from the edge along the bottom half of the sheet, and continue to place another 5 tablespoons along the sheet, one at a time, about 1/2 inch apart. 10. Moisten the top half of the sheet using your fingertips and a little bit of water, fold over the bottom, and press along the edges to seal. 11. Using a ravioli cutter, or a sharp knife if you don’t have one, cut between the pockets to form ravioli squares. 12. Repeat with other dough strips until all of your ravioli is cut. 2. Mix together spices and zest. 3. Line a pan with foil and place pork cubes on it. Sprinkle with seasoning and toss to coat. 3. Cover with foil, and bake for about 90 minutes, turning the pork cubes every 30 minutes to prevent burning. 4. Once cooked, cool and then shred using two forks to prepare and have ready to be included in your Cinco De Mayo Menu. Make sure you top these with our secret (and crazy good!) avocado cream sauce from above. I hope you found at least one recipe on this list that you’re going to try out for your Cinco De Mayo Menu. 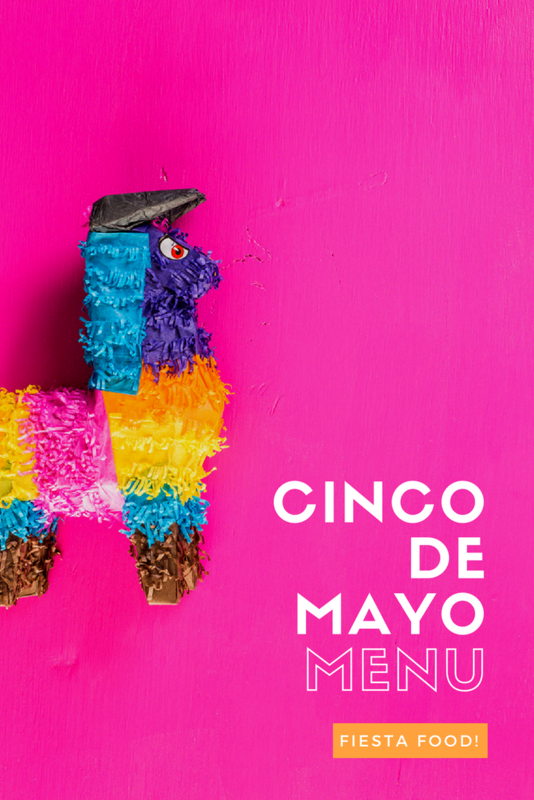 I had so much fun creating them, but the real fun is always in the taste testing ;) Share with me some of your Mexican favorites or special Cinco De Mayo traditions that you have to celebrate this fun and festive day! (Fiesta Photography ©Alexander Grabchilev/Stocksy United).